The latest art exhibition in Seoul will showcase how the writing system of Korea is not only an efficient means of communication, but also admirable for its artistic value. 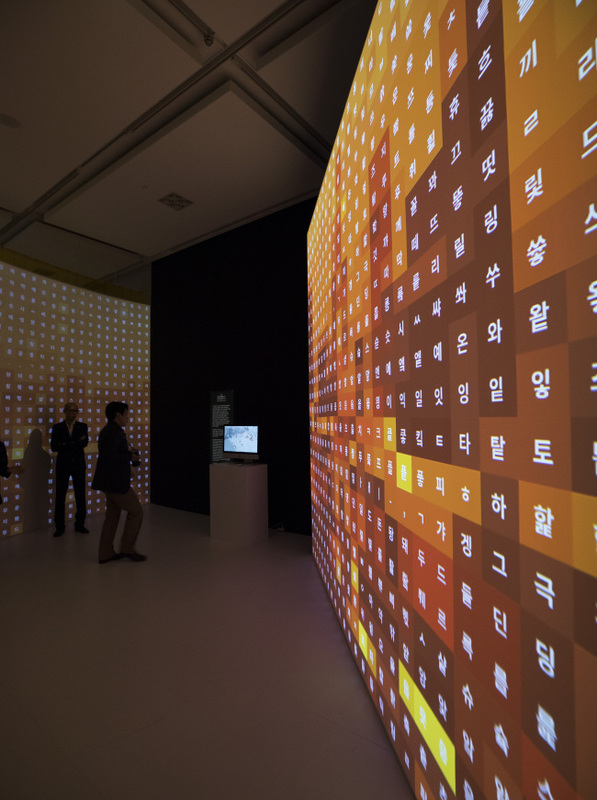 “SoundXHangeul: Variation Of The Korean Alphabet” opened Monday at the Special Exhibition Hall at the National Hangeul Museum where it will run until June 3. It was planned by the state-run NHM as part two of a three-part project demonstrating the excellence of Hangeul. According to the organizers, the project was launched to commemorate the 600th anniversary of King Sejong the Great‘s ascendency to the throne. The king, widely regarded as one of the greatest kings in Korean history, invented Hangeul for the commoners to communicate easily through writing. The exhibition explores the fundamental principles of how Hangeul’s 19 consonants and 21 vowels are expanded to 11,172 combinations, and express the various forms in art pieces. The topic is the sound, in reference to how the letters were created based on sounds. The exhibition consists of nine art pieces by Korean artists, which range from visualizing the sounds created by pronouncing Hangeul to depicting the Hangeul form through motional art pieces. 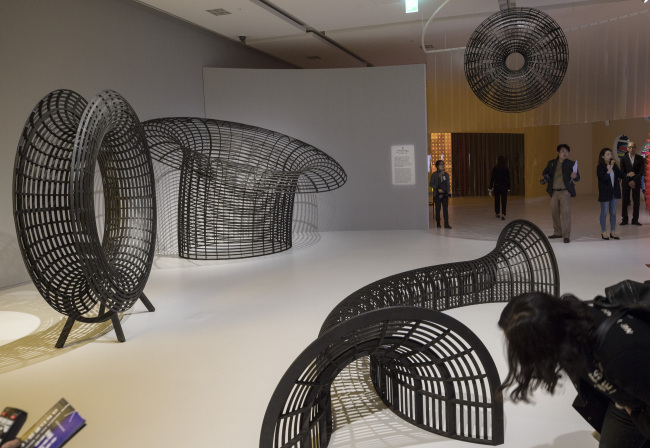 “Movement to Create Letters” by visual artist Vakki, consists of various moving objects that, through repeated motions, draw Hangeul characters mid-air. Through the motions, it creates percussion sounds somewhat like traditional Korean folk music. “Wave Series” by Wang Hyeon-min visualizes the sound waves that are emitted when Hangeul is pronounced, through sculptures. “Between the Lines” by Nameless focuses on the combinations of Hangeul. The five lines representing the consonants and three lines symbolizing vowels depict the various combinations that can be presented through the characters. In order to aid the visitors, guided tours will be provided during the exhibition. Korean commentary is provided at 11 a.m. and 3 p.m. on weekdays and weekends, and English commentary is at 2 p.m. on Wednesdays, Chinese at 2 p.m. on Thursdays, and Japanese at 2 p.m. on Fridays. The opening hours for the NHM are 10 a.m. to 6 p.m. all week long, except on Saturdays and the last Wednesday of each month, when the exhibition is open from 10 a.m. to 9 p.m. It is closed on Jan. 1, Lunar New Year’s day and Chuseok holidays. For more information, visit the official homepage at http://www.hangeul.go.kr, which offers information in Korean, English, Chinese and Japanese.